We celebrated a birthday party this weekend. 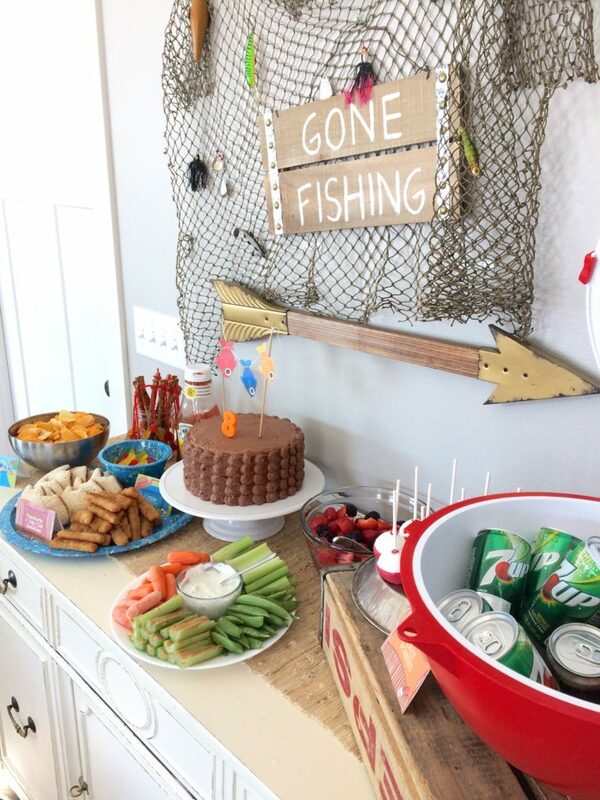 One of our kiddos loves fishing so we decided to switch up our usual “sports” theme to a “gone fishing” themed party. If you’ve followed me before you know I LOVE a good party. Or, more accurately, I love to decorate for parties; cute invitations, creative party favors, and lots of coordinating hanging things. Usually, I design it all on my own. This year I purchased a printable kit from a shop I found on etsy called Sunshine Parties. That made it so much easier to get the look I wanted for way less time, seeing as the party was squished between Lego League competition, basketball, church, and hockey. Ah! 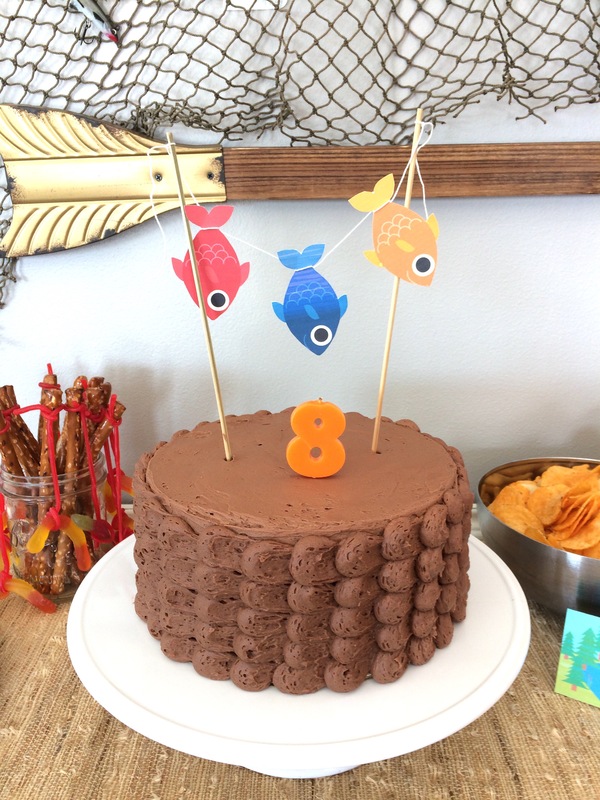 Printable fish banner to match the printable cake topper from Sunshine Parties. 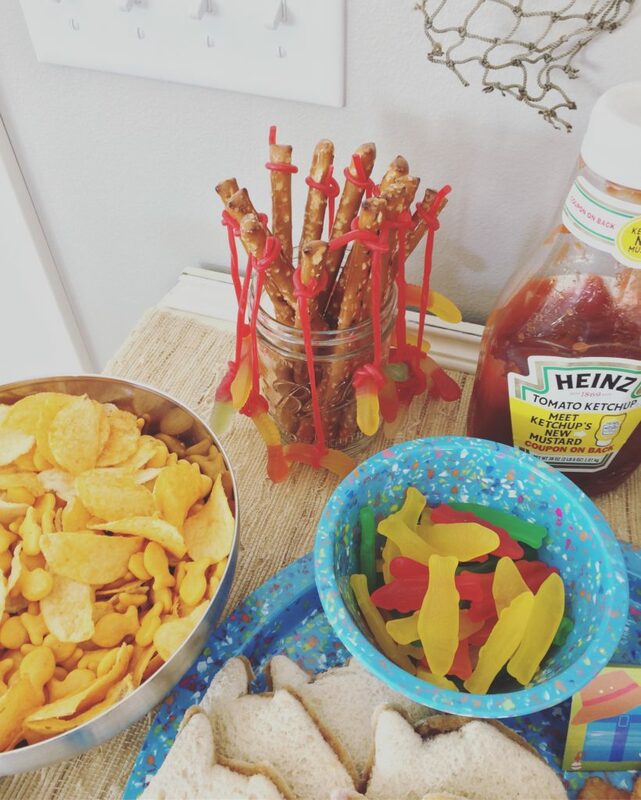 For this party, we even coordinated the food with the fish theme. I found lots of ideas on Pinterest and decided on a few. 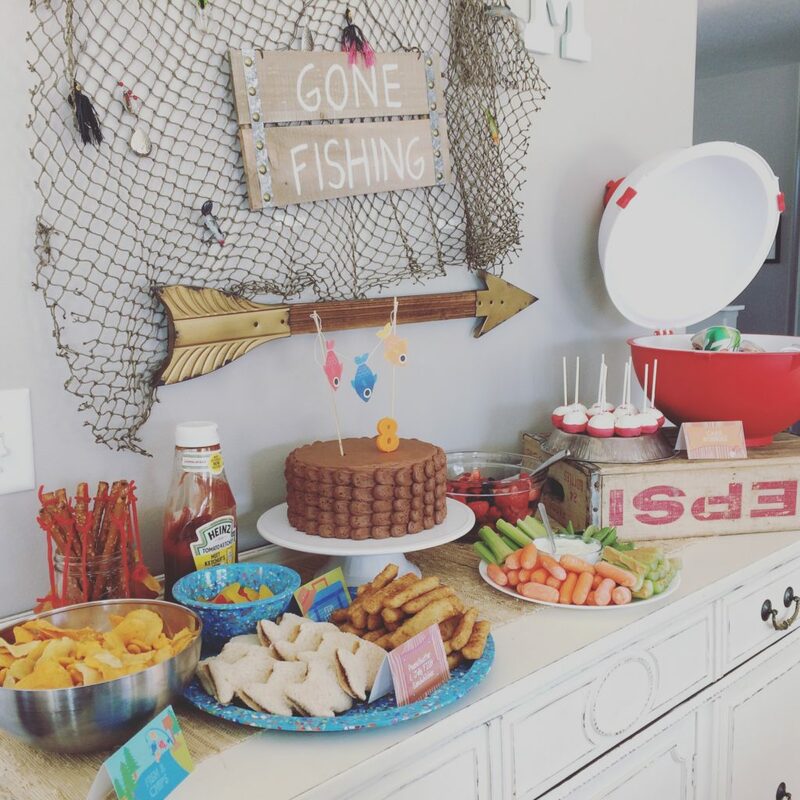 We had “Peanut Butter and Jellyfish Sandwiches,” regular PB&J’s cut with a fish cookie cutter; “Fish-n-Chips,” goldfish with potato chips; and “Cake Bobbers,” which were cake bites dipped in white first and then red to look like bobbers. 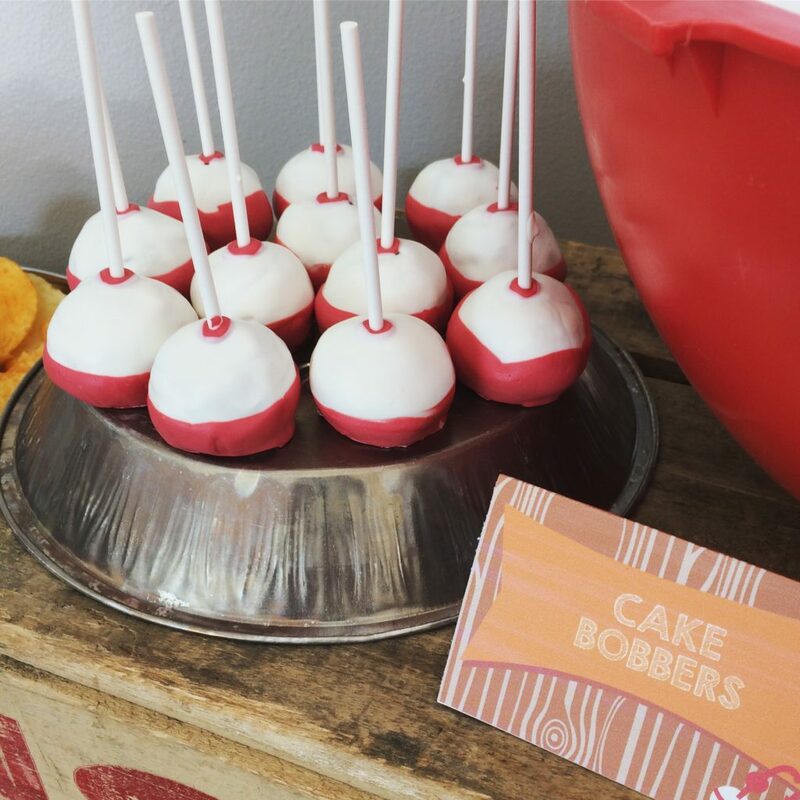 I asked a baking friend if she would make the bobbers for me but she was booked. Here’s a confession you might already know about me: I VERY MUCH DISLIKE MAKING CAKE POPS. Or cake bites or cake balls. They are not my thing. These aren’t as polished as my cupcakes usually are, but they were edible and the kids thought they were cool. Good enough. To continue with the fish food theme, we had fish sticks, Swedish Fish (which they ate ALL of -sorry parents) and another Pinterest idea, fishing pretzel rods baited with gummy worms and tied to the rod with candy rope for the line. Aren’t they fun?! To finish off the buffet we had some fruit and veggies just to make me feel good about myself and some mini soda cans we threw in “The Big Bobber” cooler my husband got as a groomsman gift a few years ago. 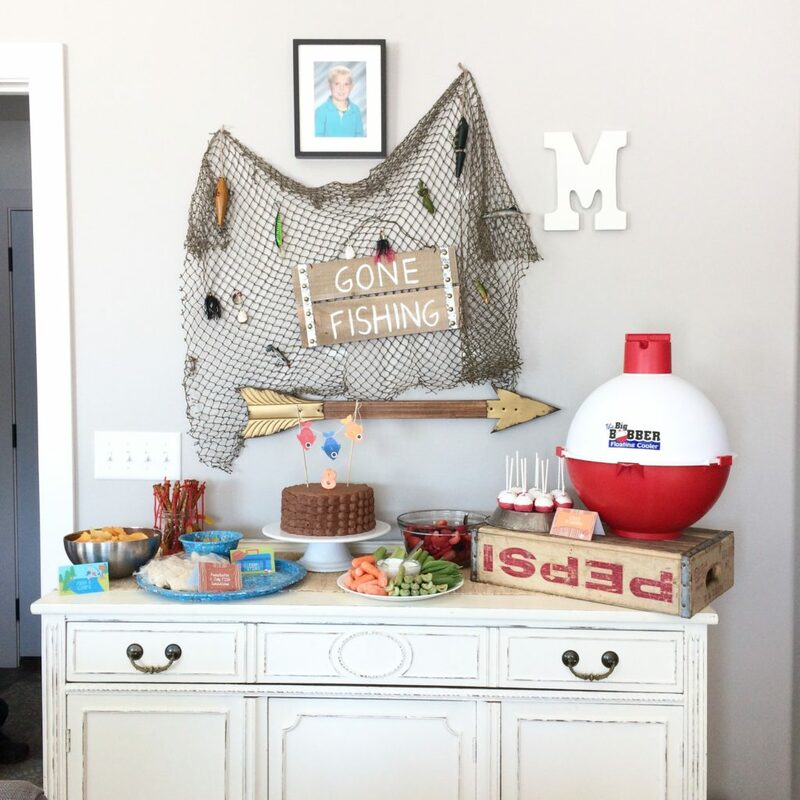 I’m a big fan of “use what you’ve got” when it comes to décor and that bobber cooler finally paid it’s dues with this party. The only items I bought for the decor was the fish net and the sign. I hand painted the “Gone Fishing” (with a G at the end, by the way because that’s how it’s spelled, I was told) onto the blank sign. It was $8 and the net was $6. Both are now hanging in my sons’s room as permanent decor. Waste not, want not! But for the party I dressed it up with some of his colorful tackle. For the cake, the birthday boy chose marble with chocolate buttercream because “everybody likes that.” As popular as this design is, I had never actually done it before. It’s always good to test out new decorating techniques with our own parties. It was successful and my son even thought it looked like fish scales. Win-win! 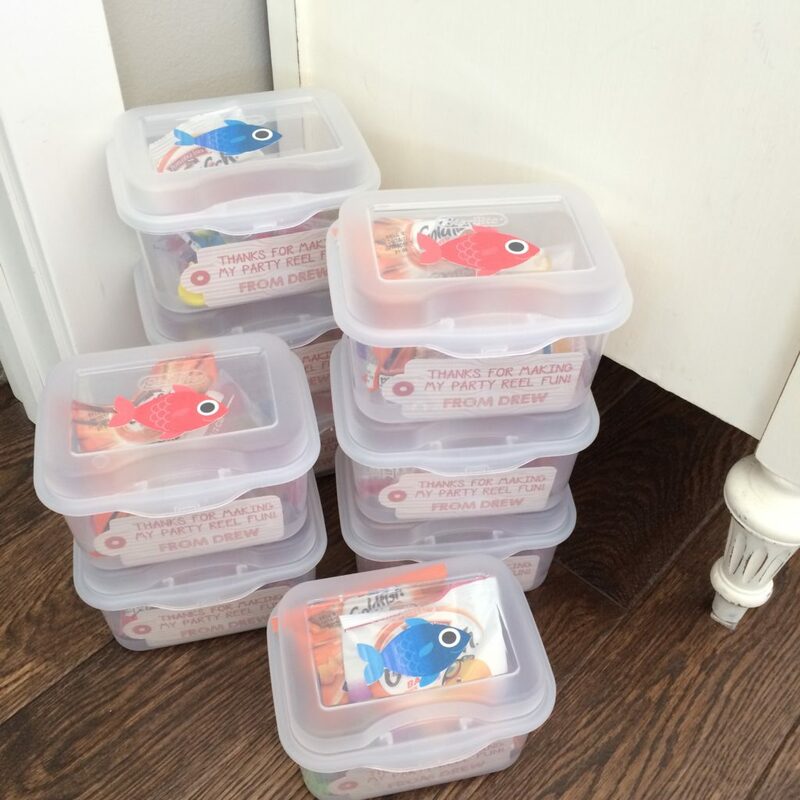 Finally, for the party favors, we found some craft storage containers at a hobby store that looked like mini tackle boxes. 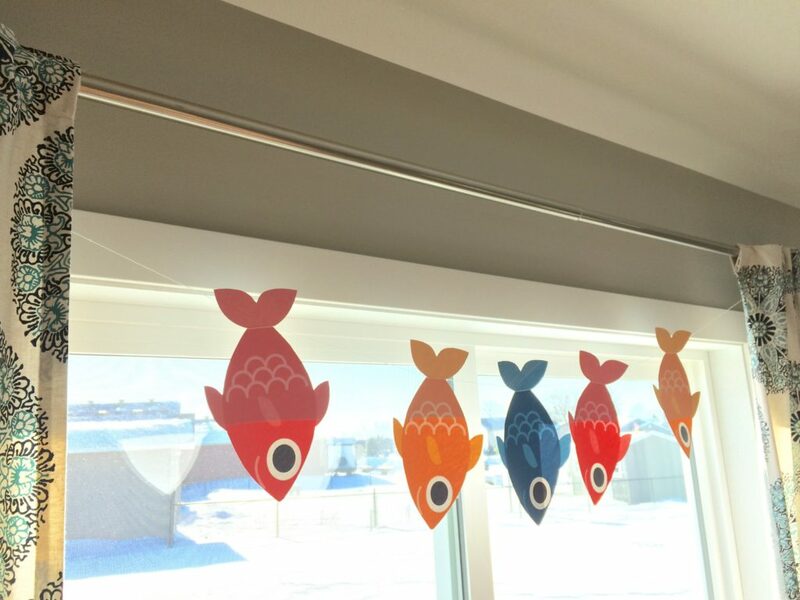 We filled them with bobbers, goldfish, Swedish fish, and a few other fishing necessities and decorated with more printables from the Sunshine Parties set. They were a hit, AND (hopefully) reusable!